In 1825, Thomas Ellicott built the first balance-beam platform scale in the world, for the New York Coal Co. Ellicott formed Ellicott & Abbott to manufacture his scales. By the mid-1840s the name had changed to Abbott & Co. Meanwhile, Augustus Ball Davis patented and built a series of scales covering a broad range of sizes. He operated under the name of A. B. Davis & Co. He, along with Charles M. Banks, also developed a line of machinery for testing materials such as iron bars, railroad rails, and concrete. And, most importantly for us, he designed and built a simple wooden-frame solid-chisel mortiser that used a foot pedal to advance the chisel. By 1865 Davis had sold his business, which became Banks, Dinmore & Co. The company's most important asset was their portfolio of patented designs, all due to Mr. Davis. Frederick A. Riehlé purchased a minority share of the business in 1865. In 1866 or '67 Riehlé convinced his partners to acquire the assets of Abbott & Co., which was in financial difficulty due to mismanagement. In 1867, Frederick and his brother Henry bought out the other investors and changed the name to Riehlé Brothers. Henry died in 1890. In 1891, an anonymous competitor paid a large sum of money for Riehlé Brothers' scale business. They took away, and eventually destroyed, all stock and patterns. Riehlé Brothers continued in business with their line of materials testing machinery. In 1903 the business incorporated as Riehlé Bros. Testing Machine Co. The mortiser business seems to have ceased shortly after 1879; it was never more than a minor sideline for any of its owners. Ad from 1877 "Goulding's New York City Directory"
The American Railroad Journal for May 12, 1849 has an ad from Ellicott & Abbott, for railroad scales. The works were at "9th st., near Coates, cor. of Melon St." and the office was at "No. 3, North 5th street". The Farm Journal lists the premiums awarded at the Fifth Annual Exhibition of the Pennsylvania State Agricultural Society held in September 1855, including a silver medal granted to Abbott & Co., of Philadelphia, for the best hay and cattle scales. Report of the Transactions of the Pennsylvania State Agricultural Society for the Years 1861–'62–'63 lists Abbott & Co. as winning a diploma at the 1859 "Exhibition at Philadelphia" for "second best hay and cattle scales" behind A. B. Davis & Co.
Banks, Dinmore & Co., (successors to A. B. Davis & Co.) (Chas. M. Banks, Robert H. Dinmore, Lewis Haupt & Frederick A. Riehle), manuf's platform scales, N W 15th & Penn ave. 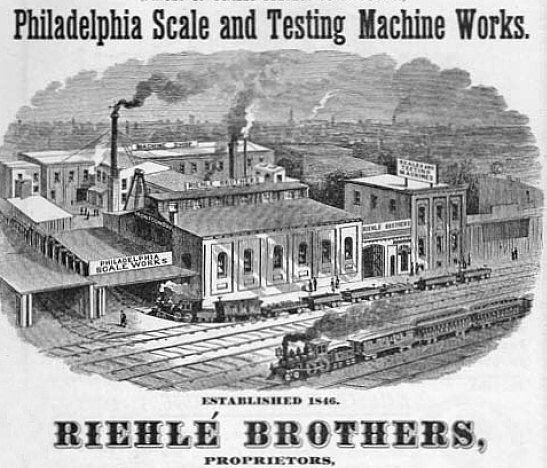 The 8 May 1869 issue of Scientific American carried this advertisement: "Riehle Bros., the Modern Scale Makers, successors to Banks, Dinmore & Co., 9 and Melon Streets, Philadelphia. Circular describing their recent patents, and containing testamentary letters, sent free on application." Listed in a work published by the United States Centennial commission, Official catalog of the 1876 Centennial National Exhibition, as a maker of mortising machines. Goulding's New York City Directory for the Year Commencing May 1st 1877, ending May 1st 1878 has an ad for "Philadelphia Scale Works. Riehle Brothers, Scales, Testing Machines, Foot Mortisers, 83 Liberty Street (Room 2), New York." The December 1878 issue of Manufacturer & Builder has an article on Riehle Bros. balance-beam scales. They were mostly aimed at big jobs, with capacities of up to 12,000 pounds. An 1879 catalog has their "standard foot mortiser", priced at $28 including four chisels ranging in size from 5/16 to 5/8 inch. "Favorably known and in use for over 30 years, in Pennsylvania and New York." The Record of Growth for February 1881 has the following article. The November 1885 issue of Manufacturer & Builder has an article on a marble molding machine. The Railroad and Engineering Journal for November, 1887, has the following note: "RIEHLE BROTHERS, proprietors of the Philadelphia scale Works, have recently received large orders for track and wagon scales, charging scales for furnaces and testing machines, and are very busy." The May 1888, September 1888, August 1889, January 1891, and March 1891 issues of Manufacturer & Builder had articles on Riehle Bros. products. The January 1889 issue of Manufacturer & Builder has an article on "The Riehle Bros. Coal-Hopper Scale". The February 1889 issue of Manufacturer & Builder has an article on "The Riehle 60,000-Pound Screw-Power Vertical Testing Machine", which could be seen at the Riehle Bros. Works at Ninth and Master Streets, Philadelphia. Henry B. Riehlé, the senior partner of the firm of Riehlé Brothers, scale and testing-machine manufacturers, of Philadelphia, died April 25, 1890, at his residence in Philadelphia. He was an active member of the firm, devoting the greater part of his time to the improvement of the several articles of their manufacture, and superintended the manufacturing interest at the works. His loss will be greatly felt in the business community, and in the religious and benevolent associations with which he was connected. Mr. Riehlé was a member of the firm of Riehlé Brothers since its organization, nearly a quarter of a century ago. He leaves a widow and one child. The death of Mr. Riehlé has caused a dissolution of the partnership existing for a number of years. The interest of the deceased partner has been acquired by the surviving brother, and the business will be continued under the name of Riehlé Brothers, as heretofore. The June 1890 issue of Manufacturer & Builder has a full-page article on the Riehlé Bros. 200,000 pound screw-power testing machine. The February 1894 issue of Manufacturer & Builder shows the Riehle "measuring and per cent gauge", a product of the Riehlé Bros. Testing Machine Co. of Philadelphia. The April 1894 issue of Manufacturer & Builder has three articles on Riehle Bros., on two different types of testers and a cement mixer. The EAIA Directory of American Toolmakers lists Riehle Bros. of Philadelphia, makers of machinist tools and scales. The listed mark is "RIEHLE BROs/PHIL'A". It further says, "The marked tool is a beam scale; an 1886 primary source called them makers of testing equipment. They made micrometers patented 7 July 1891 and 27 March 1894 by John D. SLoan; those were later made by L. S. Starrett." The book Fifty Years of a Businessman's Life: Reminiscences , by Frederick A. Riehlé, was published in 1916 by Riehlé Brothers Testing Machine Co. Only 50 pages long, it is available through Google Books (U.S. only). Among the tidbits in that book are that Riehlé purchased a two-fifths interest in Banks, Dinmore & Co. in October 1865. He also mentions that Abbott & Co. was in financial difficulty as a result of mismanagement and was put up for sale by the trustees. To prevent that business from falling into the hands of a more competent competitor, and also to gain their considerable customer base, Riehlé arranged for Banks, Dinmore & Co. to buy Abbott & Co.; this was in 1866 or '67. In 1867, Riehlé and his brother bought the remaining three-fifths of the business and renamed the business to Riehlé Brothers. The AmericanArtifacts.com web site had a listing for a Kirhle [sic] mortiser, which is now sold. The label on the machine reads "Kirhle [actually, "Riehle", though the Gothic script is difficult to read] Bros, Scale Manufacturers, Philad. Scale Works, established 1846, successors to Abbott & Co. and Bates, Dinmore & Co."
Web searches for the name "Kirhle" turned up nothing. Searches of the two "Making of America" archives produced no matches at all, nor did searches for "Bates, Dinmore" or "Bates, Dinsmore". We found an 1849 weigh-scale patent to a Samuel A. Abbott of Philadelphia; see the Patents section, below. There is nothing to tie this patent to "Abbott & Co." other than the inventor's surname and location. An owwm.org discussion on a Kirhle/Riehle Brothers mortiser revealed that Kirhle was a misreading of Riehle. Thanks to Matt Hankins for that discovery, and thanks to Art Shaw for bringing it to our attention.